Welcome to the K-Inpainting web page. Power Density Spectrum for a duty cycle of 83% computed using an FFT on the inpainted time series. In asteroseismology, the observed time series often suffers from incomplete time coverage due to repeated gaps. The presence of periodic gaps may generate spurious peaks in the power spectrum that limit the analysis of the data. Various methods have been developed to deal with gaps in time series data. We propose a new approach to handle the problem, the so-called inpainting method. 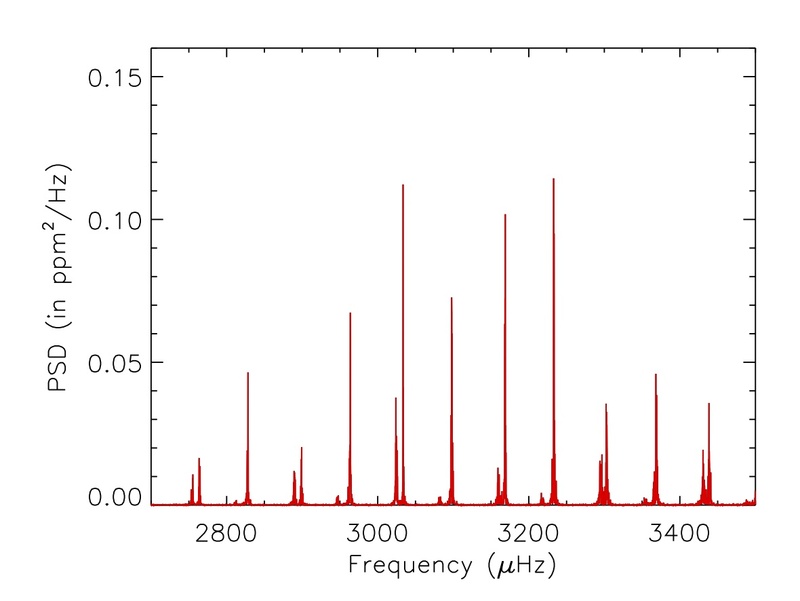 This technique, based on a sparsity prior, enables to judiciously fill-in the gaps in the data, preserving the asteroseismic signal, as far as possible. This method can be applied both on ground and space-based data. It appears that the inpainting technique improves the oscillation modes detection and estimation. The impact of the observational window function is reduced and the interpretation of the power spectrum is simplified. Additionally, it can be used to study very long time series of many stars because its computation is very fast. System Requirements: The binaries C++ called by IDL routines are not available for all the systems. The supported platforms are: Linux and Mac OS X. Before to run run_mca1d.pro, run init_var.pro to initialize the C++ environment variable. Software Requirements: The IDL Inpainting software requires that IDL (version 6.0 or later) to be installed on your computer with the IDL Astronomy Library. Please acknowledge use of the code in any resulting work, citing Pires, et al, 2014. For questions and feedback or to be informed of the forthcoming versions, send an email to . The research leading to these results has received funding from the European Community’s Seventh Framework Programme (FP7/2007-2013) under grant agreement no. 269194 (IRSES/ASK). R.A.G, S.M, and S.P. acknowledge the School of Physics staff of the University of Sydney for their warm hospitality during the IRSES research program. S.M. thanks the University of Sydney for their travel support. NCAR is partially funded by the National Science Foundation. This work was supported by the European Research Council grant SparseAstro (ERC-228261) and was also partially supported by the NASA grant NNX12AE17G.